Quick. Easy. Not horrible for you. Quick. Did I mention it was quick? My second favorite recipe is not the at-home “so much better than take out” version that involves breading and frying, a million ingredients to make the sauce, and ending with a kitchen that looks like a just spent the day cooking Thanksgiving dinner. And let’s not forget about the bonus morning-after-frying smell that is now permanently embedded in every strand of your hair. My second favorite recipe is a quickly whipped-up, stripped-down version created out of desperation. 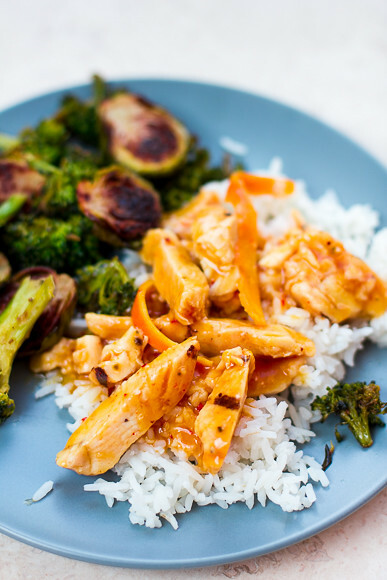 It requires a handful of ingredients, leftover chicken, and… that’s it. In minutes, you have a sauce with a bright citrusy punch and a light kick that marries perfectly with chicken and rice. Semi-pro tip: There are three things you’ll always find in my fridge or freezer: a repurposed wonton soup container of lime juice, frozen rice, and already-cooked chicken breast for “emergencies.” (These days, that seems to basically be every weeknight.) Maybe I’m totally on my game (ha) and planned ahead (all of the LOLs) by cooking a large package of bone-in chicken breasts in the crockpot… or maybe I’ve just hit up Costco and splurged on the package of rotisserie chicken breast. 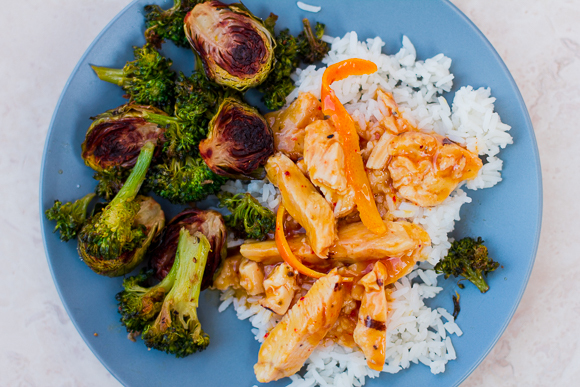 A healthier alternative to take-out with a fresh, bright sauce that packs a citrusy punch. Sliced green onions, for topping. Use a vegetable peeler to remove the zest in long strips from 1 orange. Slice the strips into thin slices. If you don't have an emergency bag of rice in the freezer, cook 1 cup rice (to yield 2 cups) according to package directions. 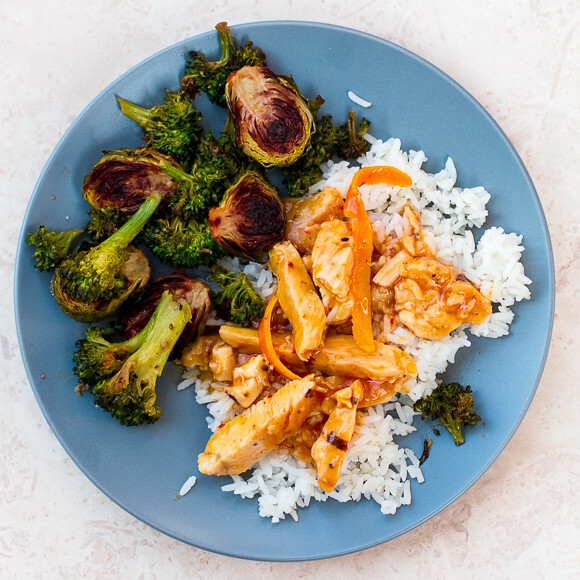 In a medium sauce pan, heat the sesame oil, garlic cloves, red pepper flakes (two pinches of you aren't sharing with any Littles), and black pepper over medium heat until it begins to sizzle. Add the orange zest, 1 cup orange juice, the ketchup, fish sauce, and the soy sauce/coconut aminos. Stir until uniform, increase the heat, and bring to a boil for 2-3 minutes. In a small cup, mix the cornstarch/arrowroot powder with 1 tsp water. Stream into the sauce while whisking. Turn off the heat and add the chicken, tossing to coat. Serve over cooked rice with a sprinkling of green onions, next to something green. I want the recipe for door #2 please! The takes forever and a zillion dishes but tastes amazing. Sometimes you just gotta do what you gotta do.